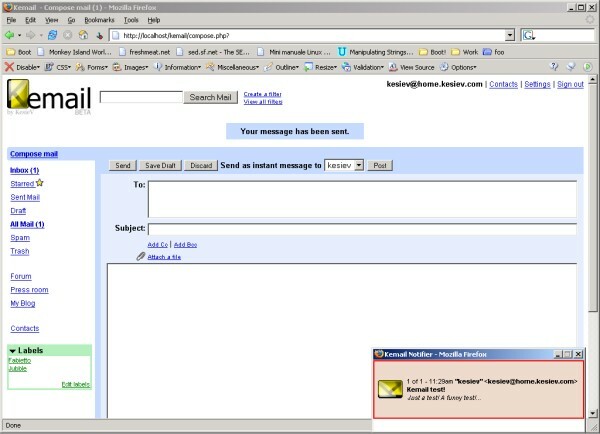 Kemail is no longer available - sources were lost time ago. Do your backups responsably - I'm keeping this page just as memento. Tada! Kemail demo is (probably) online now on my poor PC! Jump to the "Try it!" section for some details! Demo delayed. Enhanching features! Demo will be online in this weekend. Can I do something like that? Using free stuff like the usual-webnerd kit Apache-MySql-PHP? 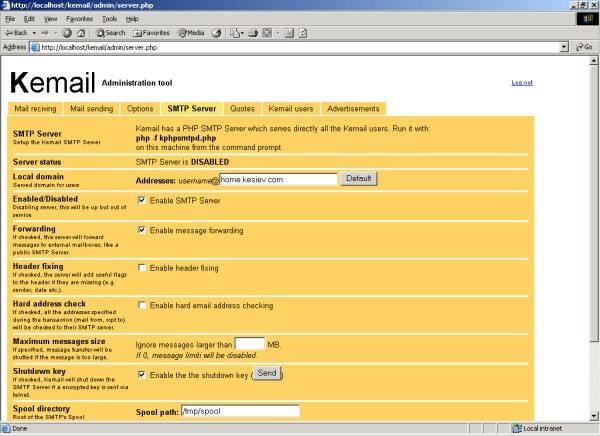 Kemail is a webmail interface written in PHP that uses MySQL and Apache to reproduce the same behaviour of the Google's client. 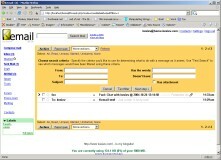 A webmail client, packed with automatic filters, labels, trash & spam folder and full text search. It can be keyboard-driven, using predefined key macros. A mail forwarder. 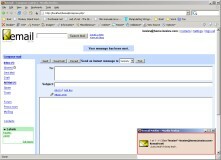 It can forward messages to another mailbox using composed rules... without changing your mailserver! 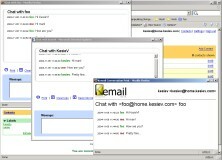 A mail server. 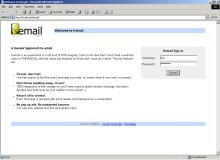 It has a simply SMTP server integrated with his users that features mail redirection, send, reciving and mailbox size limit. 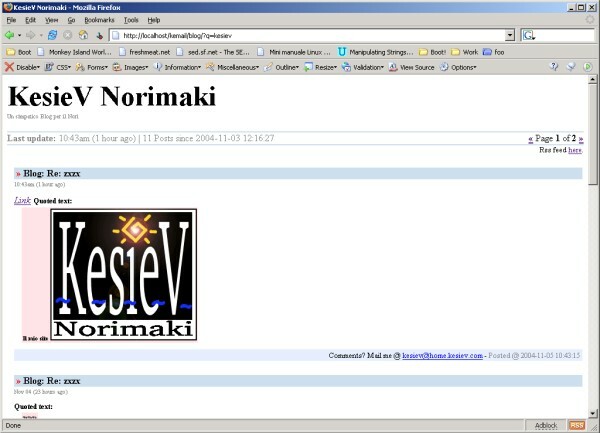 And is configurable from the Kemail control panel! 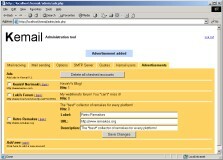 An advertiser: the classic plain-text ADs can be configured from the Kemail Administration Panel. It also has a click-counter! 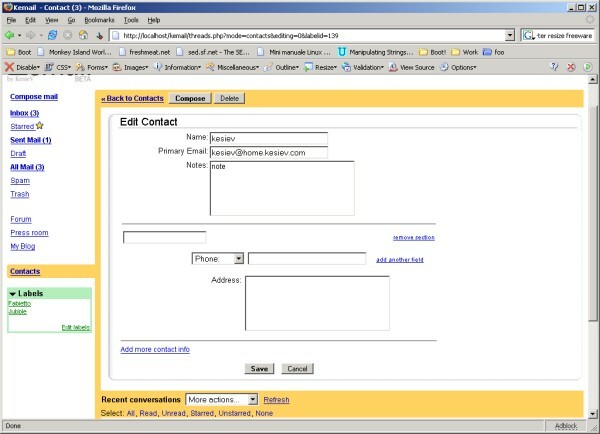 A contact manager. 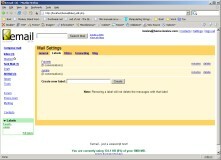 It stores automatically your addresses, showing you the "most mailed". 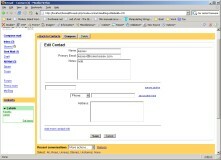 Contacts can also have description and details with custom fields. 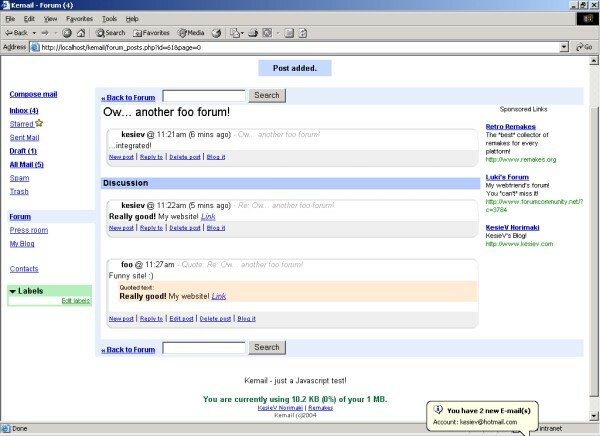 A private forum. Discuss it with the Kemail forum! Add and remove in few clicks... and give permissions to your users from the kemail administration page! A blogger. Skinnable blog sites for every user! 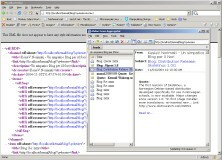 Features RSS feeds and blogging of everything in the client! A guide builder. Create your own skinnable help pages using a simple/bbcode-like synthax! 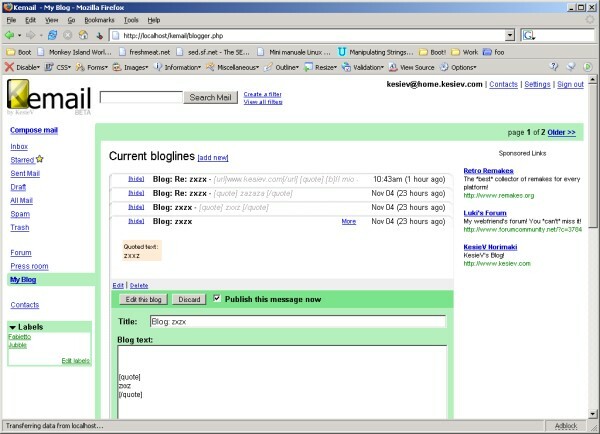 An RSS aggregator. Fresh news from the world! 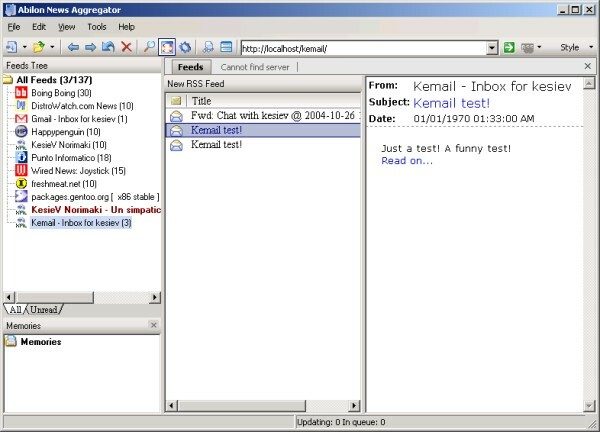 Kemail can allow users to reads RSS newsfeeds. And they can also share their feeds! Customizable! Customize EVERYTHING! Footer links and legals, adverts and the whole logo! 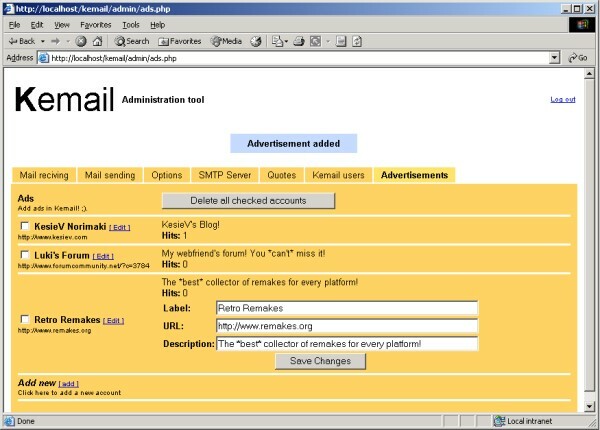 And... if you are unsatisfied... Kemail is built over a rellay simple skinning engine! 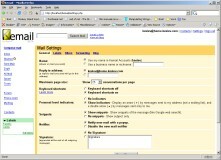 Group photo: mail browser and the old-but-useful popupped contact list. "Interesting" mail details... let's print 'em! 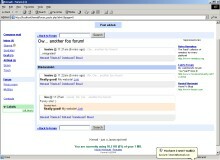 The blogger interface... in pure Gmail style! Publish, hide, edit and delete your posts! One of the blog site themes... create your own style in minutes! Read Kemail blogs from your desktop RSS reader! ...and the new mail's snippets! 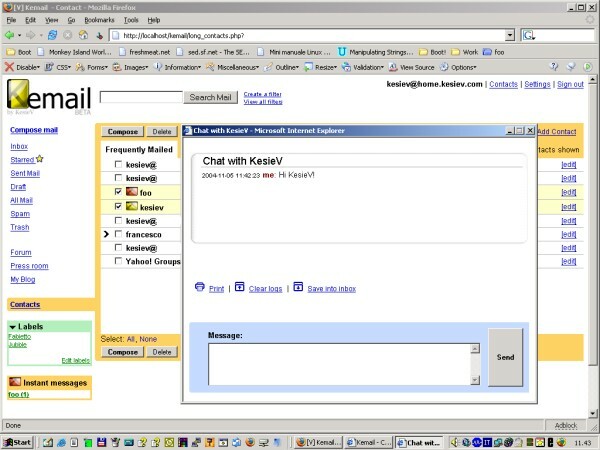 The Kemail Instant Messenger (a bit buggy in this old screenshot - ndKesieV). 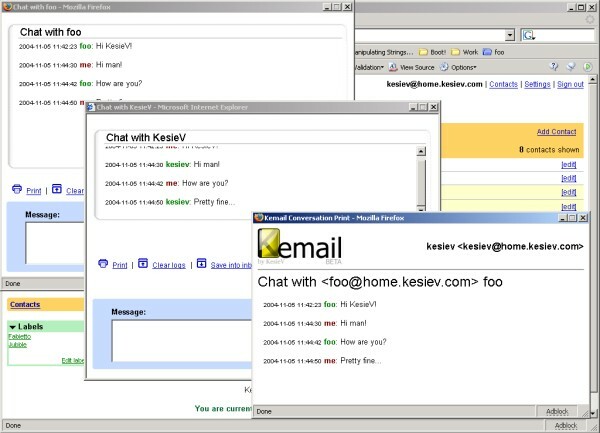 Chat with other Kemail users without any client! Some famous RSS feeds... And the mine! The contact list. 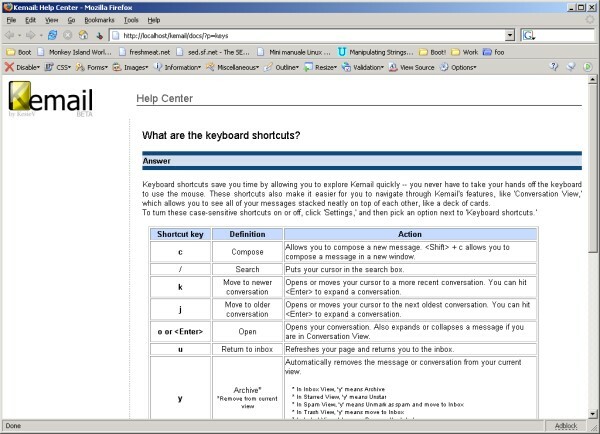 Is searchable, keyboard driven and auto-filled when new mail comes. 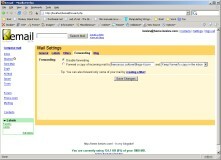 I'm forwarding this really interesting mail... And I'm using the autocompletion! It saves me time... for implementing more stuff! 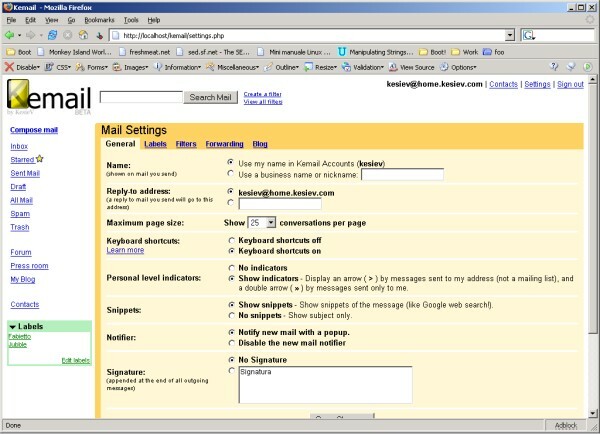 What makes Gmail special are the labels... one message can be multiple-labelled and easy to find... Well... labels are also in Kemail! What the HELL are the macro keys? Asking to the guide... Is the time to Learn more... LOL! This is the AD configuration panel. 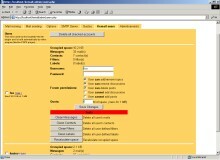 Simple interface and simple options: name, description and URL... Voil�! Your new sponsor is in the AD rotation! Let's configure the plugins... seems crappy but is REALLY useful and extendable! Clean up and resize mailboxes, set users permisssions and other stuff here! 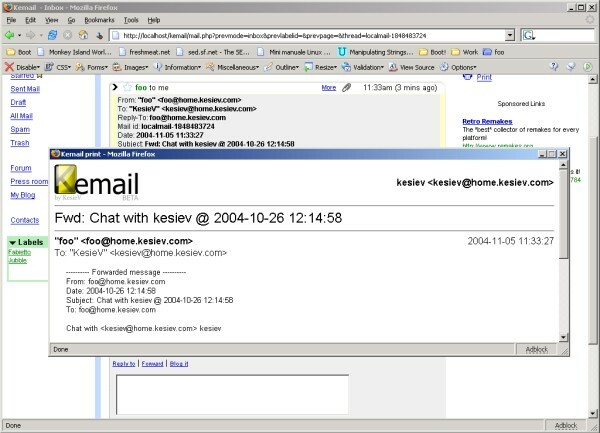 Wanna test Kemail without installing Postfix and sons? 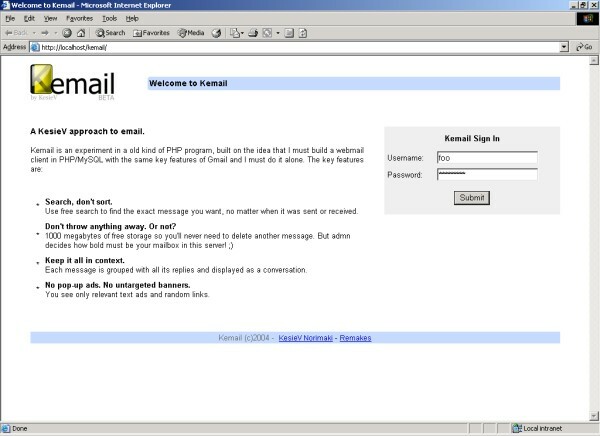 Kemail offers his little SMTP server written in PHP... Ahem... use it only for internal messages... is a bit raw... but works! I've prepared a little online demo. 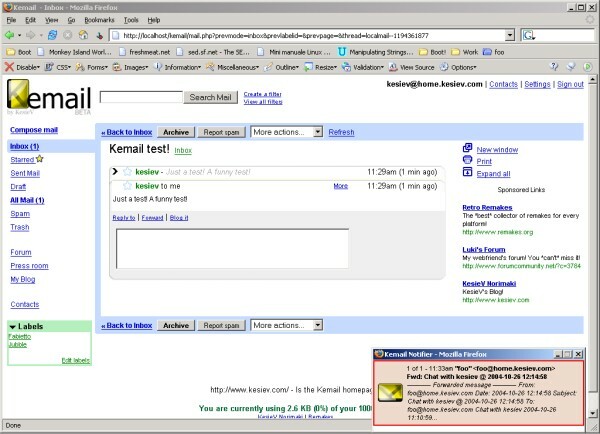 Just two comments: Kemail demo is hosted on my PC, that is a really slow computer with a really bad connection. However that it will go faster on your LAN/powerserver. Well: click here to log-in. There are two demo users: Demo1 and Demo2. 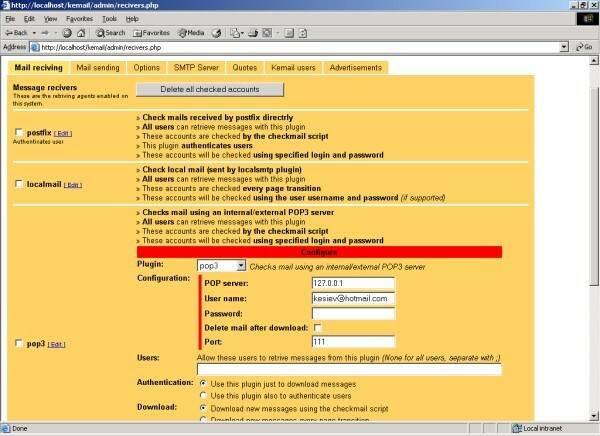 No password required but beware: login is case sensitive! Writing operations are disabled but all modules are avaible. Have a good time! PS: My PC *should* be online... but in late night I shut that damn noise-generator... because I need to sleep! ;) (as I said, my PC is REALLY poor). However, if you need to reach my server, kick an email... I'll answer as soon as possible. I'll answer to you in a flash! 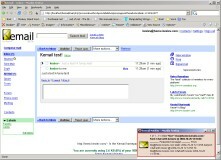 Q: How close Kemail clones Gmail? 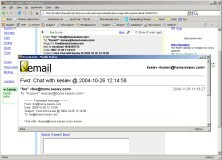 Kemail is a "scripted webmail client". I think that Gmail implements a partially offline client, sending his masks to the client and rendering stuff faster than other mail clients. 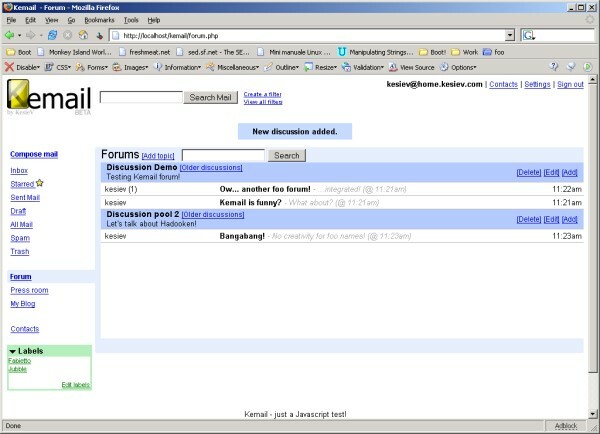 Kemail implements a more classic way to work, with a classic webpage beavihour. 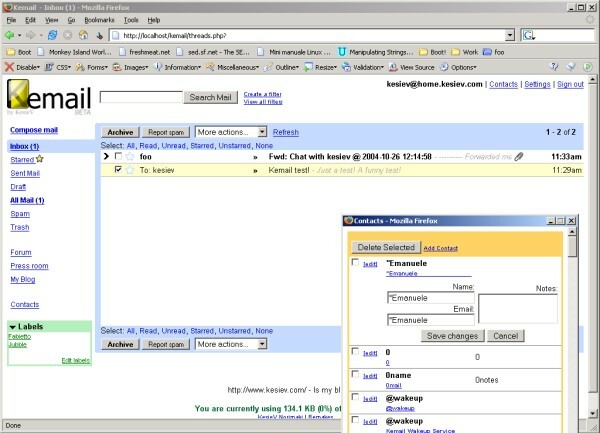 However it offers the same features of the Gmail client, that means dynamic menus, foldable messages, labels, real time notifiers and chat, filters and so on. Q: Why you've done that? Kemail, saying the truth, packs some of my little projects in an elegant/commercial/less-Hax0r environment. 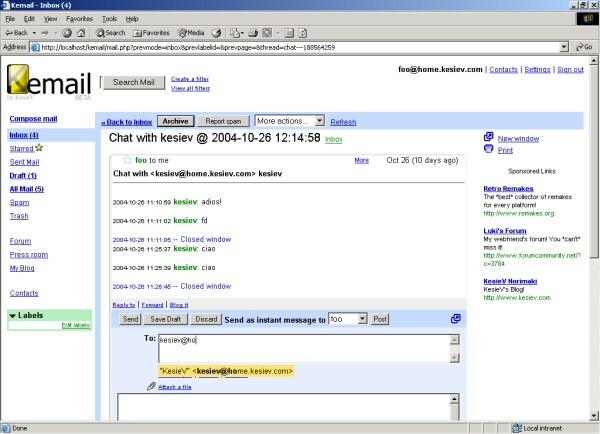 For example, the messenger uses an improved version of my UnniSee Webmessenger (log on at my homepage!). Q: Why it isn't free? When I finished Kemail, someone said to me to try to sell it (effectively, Kemail does more things than I though when I started the project). There are a lot of freeware solutions that does the same thing (lot of these clones other interfaces... cough... cough... Outlook...). But I've found this dynamcal way really impressive... and I've decided to distribute using other ways. (Lazy Jones Pocket and Jubble Bobble are two projects of mine that are distributed as freeware). Q: It works under Windows? And under Linux? Q: Which tools you've used to do that? OS: Gentoo Linux at home and MS Windows 2000 around. 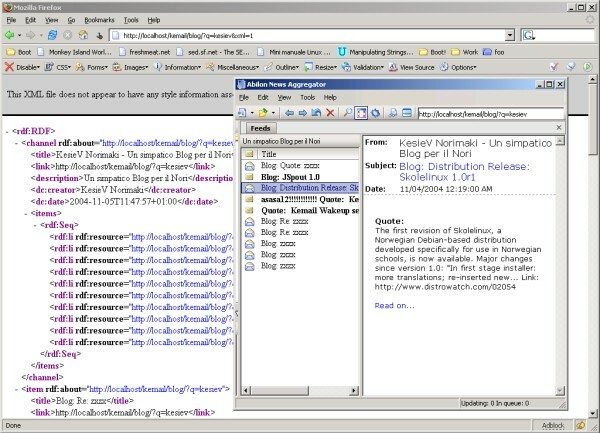 Editor: SciTE and recently PHP Designer 2005. Nerdly, a bit of Vim for some on-bash hacks. 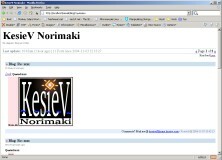 Server: emerge apache mysql php mod_php under Linux ;) ... Under Windows I've used the EasyPHP package, which is really easy to use. Food: Waffers, some crackers and yogurt. Today: Doner Kebab. Friends: LordZe, NinJoe, Marcovaldo and mr. Phab. Greets: Largo, Luxio, Enuma Elish, Myst, Scacco, my --> patient <-- mom. Cottone Francesco, a 24 years old italian computer programmer. Actually I work as web application developer for Advanced Global Solutions. As all eightees nerds, Commodore 64, Manga, Jungle/Hiphop/J-Pop music and chinese food are the right stuff. My webpage is here. Mail me @ kesiev@hotmail.com. 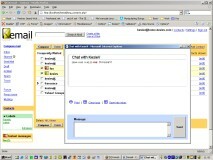 Chat with me on MSN or ICQ (my UIN is 107199617).